As a child, Shombit Sen lived in Shohidnagar, a squatted refugee camp near Kolkata. The little boy's frequent visits to nearby Chandannagar, the former French colony, shaped his dream of becoming a French artist. His humble beginnings did not stop him. 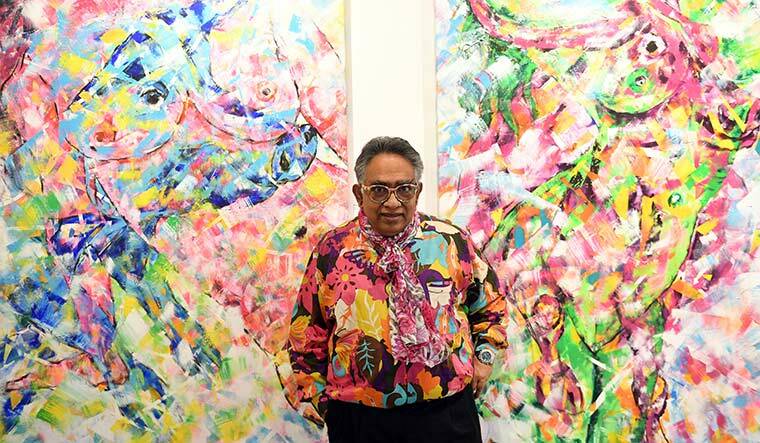 For 30 years, since 1973, Shombit Sen lived and worked in France, making his mark in the world of art with his unique style called gesturism. Bengaluru, Sen's home since 2003, is witnessing the artist's first show in the city. Indian art is frozen in the 18th century. But there are exceptions. Jamini Roy stands apart among Indian artists. 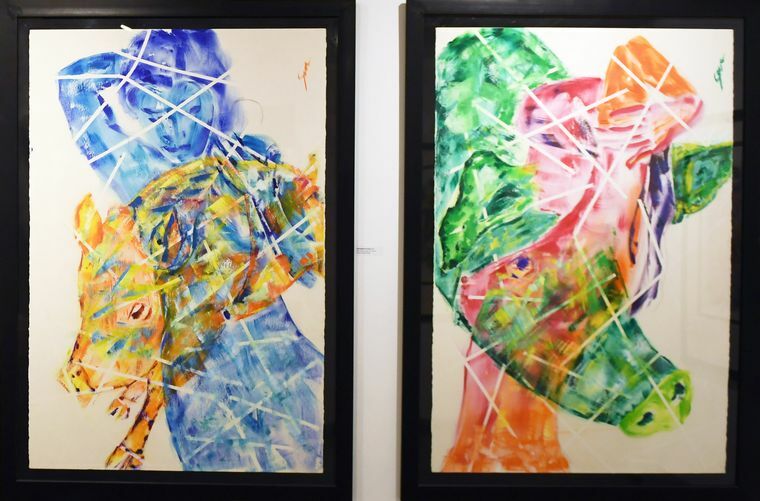 The exhibition comprising 52 pieces of work and titled Abstract with Hidden Figuratives, is on display at the Gallery Time and Space, Lavelle Road, till February 10. As you enter the gallery, the bright hues of the paintings entice you. The longer you gaze, the abstract melts and hidden figures emerge. The human, the animal, the chaos, the calmness and the affinity of humans to other creatures seem to create harmony and balance on the canvas. "The hidden element works as a catalyst to connect the two contrasts—the abstract and the figurative," says Sen, 64. Gesturism was the outcome of his intense search for an ideology. Inspired by the European artistic movements, Sen evolved his own style, where painting was impromptu, seeded in gestural movement and basking in irreverent colours. The boy who sketched with a piece of chalk on the cow dung-smeared floor of his home, would make it to the Government College of Arts and Crafts in Kolkata. In 1973, aged 19, Sen landed in Paris with his first paintings and the $8 his mother had given him after selling her gold bangles. He worked as a sweeper in a lithographic printshop, where he was exposed to the works of master painters like Leonor Fini, Alain Bonnefoit and Yves Brayer. He studied at the École Nationale Supérieure des Beaux-Arts (1974-76) and Academie Julian Penninghen (1975-77). While French art and culture became the foundation of his life, he pursued applied art as a designer for a living and worked with almost 2,000 corporate brands worldwide. Today, Sen is a full-time artist. He pays obeisance to women through his works. "Woman is an all-consuming force that binds the world and its creatures together," says Sen. "My mother was a great inspiration as she told me to never lose my passion or emotion to poverty. I met my wife Renee in 1996, and look how she has transformed my life. She made me a commercial success too." Renee is not just a partner who handles Sen's public relations, she is an artist at heart. She talks of the inherent "switch" that a woman operates effortlessly. She is referring to the painting titled Her Power Above All (2018) that depicts a woman's relationship with her infant and her lover in the same frame. Renu George, director, Gallery Time and Space, says: "It is Shombit's honesty that sets him apart. The human figures in his art and their affinity to animals remind us of the instinctual forces within humans. If the woman is a symbol of human sensitivity and sensibility, the male form is the primeval force and the child brings in the multi-faceted emotions with the feminine balancing the maternal and mating." Sen's early works in Paris were inspired by the French landscape and culture that endeared him to the French society. At the same time, his works speak of solitude and his frugal existence on a boiled egg and a banana for a meal. The artist's evolution also includes vignettes of his past life steeped in poverty. In Europe, artists could succeed only as a follower of a great artist or as part of a movement. Sen's gesturism was unique and had both French and Indian influence. "Artists coming to France are greatly influenced by its culture," says Sen. "Van Gogh broke free within a year of coming to France. Today, his most famous paintings are those painted in France. The French world view, their structure of imagination is what I imbibed. Inclusion, tolerance and adaptability are strong values of India. The two worlds converge on my canvas as my subject is universal." The absence of an art movement in India worries the artist. From 16th century till 1947, India had lost her artistic sense, dominated by the Mughals who destroyed everything, he says. He adds that his comment is not to be read politically. "Have you seen a red stone carving after the Khajuraho temple? I admire Hampi, and the sun temple in Bhubaneshwar with their elaborate art work, the consistency in its style, movement and rhythm. It is phenomenal because these structures were built over decades and by hundreds of artists. Yet it maintained the consistency. It has the entire human trajectory of life. Today, India lacks this consistency," rues Sen.
Fine art has huge power in developing the economy, contends the artist. He says that whatever one sells in the market, from automobiles to fashion, is driven by fine art. "Everything in India today is foreign. We need to infuse artistic sense. China created 40,000 art galleries after its economic reforms. But India has less than 100. If the focus is on fine art education, it can generate employment as every product needs quality and style. Indian art is frozen in the 18th century. But there are exceptions. Jamini Roy stands apart among Indian artists," he says. The Renault Kwid art car (2016) painted by Sen on invitation from Renault, depicts elements of Kolkata. 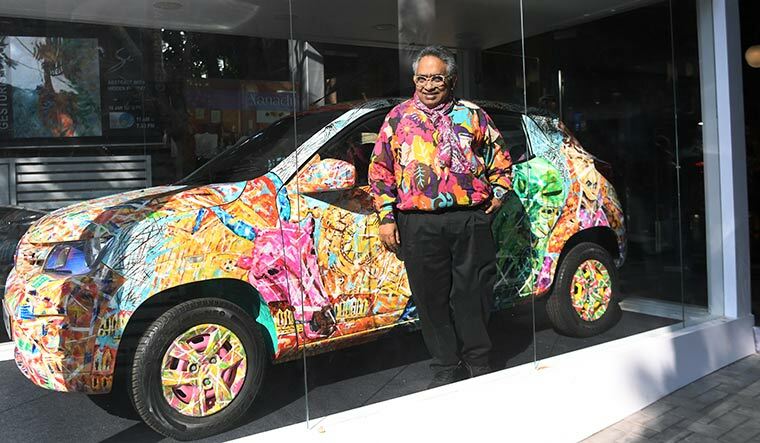 "People of India living in a city with western architecture is what makes Kolkata interesting for me," says Sen, adding the car was exhibited at the prestigious Salon d'Automne in 2018. "It is the first time an artist has narrated a story through the painting on an art car, in contrast to earlier art cars done that showed only the artist's style of painting," says Patrick Lecharpy, director of design at Renault about Sen's work. A compulsive painter, Sen paints on 20 different canvas simultaneously, but says he does not plan what to paint. “I will be touring the world in 2020. But I don't know what I will be painting. I paint for 15 hours daily and the painting emerges," he says.